Mustard greens is my absolute winter favorite. Back in my home state you'd get some variety of this leafy greens in its different stage of maturity. Here in Hyderabad, I'm blessed with one variety, a very stalky variety. But I'm not one to complain, I'll have it in whatever way, for however long I can get hold of this greens. Today's recipe is the most authentic way of enjoying mustard greens. 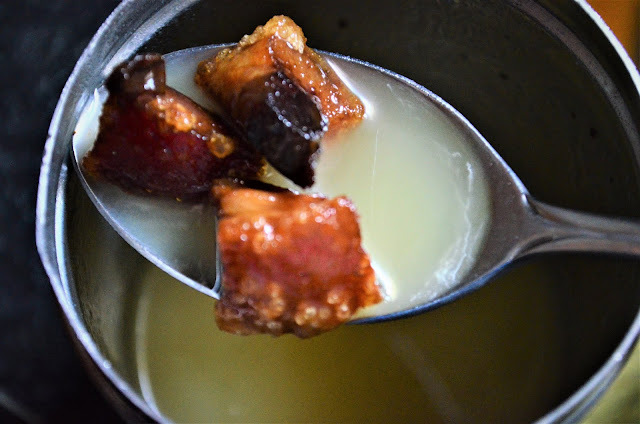 What makes this recipe Rongmei to the core is the use of rendered lard -- pork fat fermented and reduced to it's very essence -- the bomb! 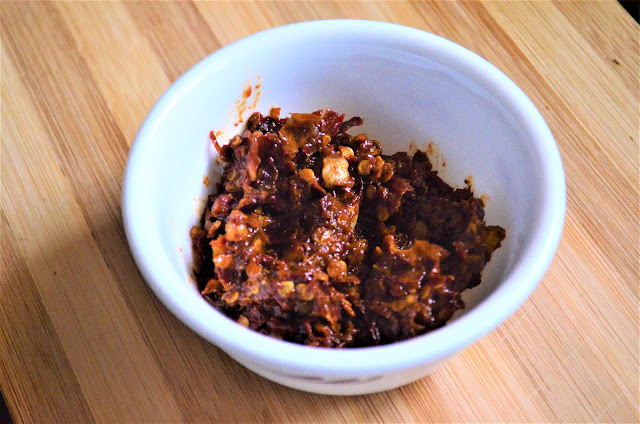 In Rongmei Naga homes, especially those residing in Tamenglong district of Manipur, vegetable dishes are prepared either by using gannampui, or ngari/ fermented fish, or smoked river fish as the ingredient that brings the dish together. Gravy dishes are always runny and thin, sometimes thickened by potatoes smashed in the pot with the back of a wooden spoon. And that's what is done here in this curry to give the thin gravy some creaminess. Regarding the use of onion it's optional, but I always use onions in my cooking because I'm enslaved to the flavor. Yup! Also, you can use regular sized potatoes; however, baby potatoes adds better flavor. If you can get your hands on the tender red potato babies, even better! 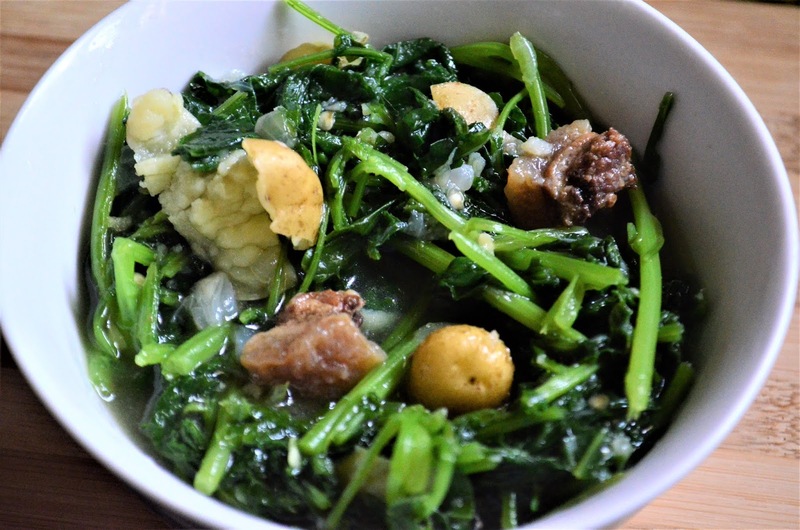 So, about this dish, my comfort food, channeling Marie Kondo, I have to say that those brown beauties sitting atop the bed of mustard greens sparks joy in me -- immense joy!😄Here's the recipe. In a pot, add water, onion, potatoes and salt. Once the water comes to a rolling boil, add gannampui and continue cooking in medium flame till the potatoes become soft. Add more water if required. Now mash up some potatoes to slightly thicken the gravy. Once that is done, take the cleaned and drained mustard greens, tear it up into bite sizes wih your hands and put it into the gannampui flavored gravy. Add garlic, give it a through mixing and cooked covered until the leaves turns limp. Your curry is done! 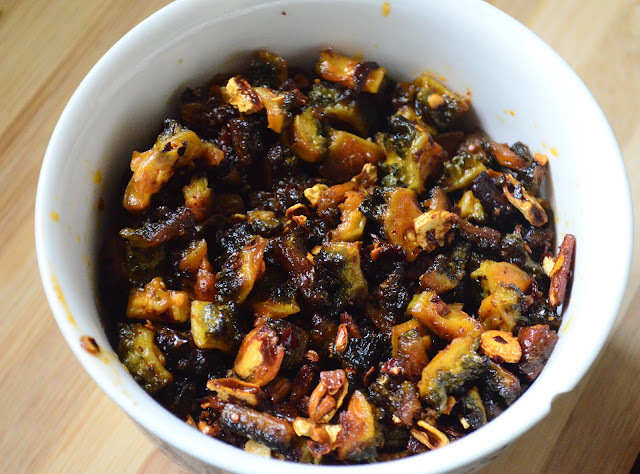 Enjoy this dish with dried red chilli chutney. Yummmmmm! A happy and blessed New Year, dear readers! January zipped passed just like that -- what is hppening? I hope this new year has been treating you well, so far. For me, the start of the year has been bitter-sweet. I'm having to let go something that I truely enjoy for something that demands more of me right now. It's bitter-sweet, literally! Considering the state of my emotion at the moment, I thought I'll start my first post for the year 2019 with a bitter-yet-yummay dish. Karela/Bitter Melon or Nkhonathoi in Rongmei is the main character today. It's a side dish, a simple, fuss free, super delicious fry recipe. I was introduced to this recipe by my colleague from Mizoram. I absoltely love it, and I've been singing it's praise to anyone who loves some Croc fry. Yup, my son use use to call karela as crocodile when he was a teeny-tiny boy😃This recipe serves two person. Heat about 6 Tbsp oil in a pan. Once the Oil is hot, put the karela in and sprinkle salt. Mix it up and let it cook covered for a couple of minutes. Now, add the remaining oil, more if required. You want to put in enough oil to fry the bitterness away from the karela, but not drench it. Once the karela begin to grow limp, add the chilli and garlic. Give it a good stirring and then cook coved on medium low flame till every bit of the karela is golden and niceeee. In the end, what you get is a dish that smells amazing and tatse as great as it's aromar. Enjoy! !